Doctor Who specials and finales are obliged to pull out the stops, and 'A Christmas Carol' doesn't disappoint in this regard. 62 min. BBC. Cast: Matt Smith (V), Michael Gambon. Isaac Newton conjectured that Christmas was calendared for December 25 to mark the winter solstice. Of course, Isaac Newton is one of the many, many famous folk encountered by the Doctor, the protagonist of the BBC's absurdly long-running science-fiction hit Doctor Who (first aired in 1963). In recent years, it's become a Doctor Who tradition to air a one-off Christmas special between seasons, the latest being the Steven Moffat-penned "A Christmas Carol." Did I mention that the Doctor once met Charles Dickens? 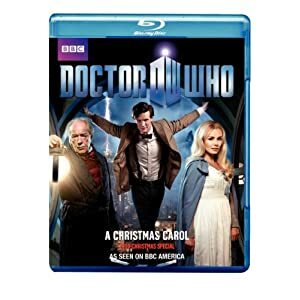 Anywho, Doctor Who's "A Christmas Carol" finds the time-and-space-travelling Doctor (Matt Smith) separated from companions Amy (Karen Gillan) and Rory (Arthur Darvill), who are trying to enjoy their honeymoon aboard a space liner. Because nothing goes off on Doctor Who without a spot of trouble, Amy, Rory, and four thousand other passengers experience turbulence caused by a planet-enmisting cloud in the liner's path. Unless the Doctor can get to the bottom of the cloud, they're all going to die. The TARDIS brings the Doctor to the door of one Kazran Sardick (Michael Gambon of Harry Potter and The King's Speech), who holds the key to the planetary cloud. Unfortunately, the richest man in Sardicktown doesn't seem to give a fig about anyone, so it's up to the Doctor to try to reach the heart of the Scrooge-like miser. Who better than a time-traveller to conjure up ghosts of past, present and future? Doctor Who specials and finales are obliged to pull out the stops, and "A Christmas Carol" doesn't disappoint in this regard. In addition to that crashing space liner and big-time guest star Gambon, the episode makes room for Welsh singing superstar Katherine Jenkins (yes, the mezzo-soprano gets to sing, twice), a scary creature best described as a fish out of water, and a tricky Dickensian pastiche that deals with Kazran as boy (Lawrence Belcher), young man (Danny Horn), and old man. The Doctor is always especially good with kids, but the novelty here is largely the way by which the character so daringly meddles with one person's past in an attempt to change his mind in the future. Kazran's hardened heart is the result not only of disappointment in love but also paternal physical abuse; the Doctor must deal with both neuroses to thaw Sardick's soul. The winter solstice marked a point "halfway out of the dark" for the Romans, and reaching that point with Sardick's psyche proves to the Doctor that his goal is attainable. It's the sort of neat bit of verbal and emotional gymnastics that has elevated the new Doctor Who above its roots as a witty but often narratively stodgy science-fiction series to its current incarnation, defined by its warmer, more inclusive vibe (of course, the show's newfound special-effects spectacle also helps). In the end, Doctor Who's success or failure hangs on the man piloting the TARDIS, and the show's in good hands with the lanky, larky Smith, who's equally capable with a one-liner and a sincere dramatic moment. Though Doctor Who continues to come to our shores in 1080i (as opposed to 1080p) hi-def transfers, the interlaced transfers continue to be rather impressive. The brisk imagery benefits from bold color and crisp details and textures; contrast and black level are rock solid, and there's no noticeable digital artifacting. Likewise, the DTS-HD High Resolution 5.1 surround mix (encoded at 2.0Mbps) is shy of the usual Blu-ray specs, but impressive all the same: sound effects are potent, and the all-important songs sung by Katherine Jenkins are piercingly beautiful. "Doctor Who Confidential: Christmas Special" (56:04, HD) continues the "Doctor Who Confidential" series constructed of extraordinarily in-depth behind-the-scenes material. Interviewees this time out include head writer Steven Moffat, director Toby Haynes, Matt Smith, Michael Gambon, Lawrence Belcher, Katherine Jenkins, Danny Horn, production designer Michael Pickwoad, producer Sanne Wohlenberg, set decorator Julian Luxton, VFX supervisor Tim barter, executive producer Beth Willis, composer Murray Gold, executive producer Piers Wenger, and conductor Ben Foster. "Doctor Who at the Proms 2010" (57:19, HD) includes brief introductory interviews with Moffat, Smith, Gillan, Gold, Foster, and BBC Proms Director Roger Wright before presenting the highly entertaining concert. Like previous concerts, this one includes appearances by cast members (Gillan hosts, and Smith and Arthur Darvill turn up). One of Smith's appearances is in character, meaning we get some original scripted Doctor Who material of sorts, as well as some funny in-character improvising by Smith. Fans will be plenty pleased with the feature and bonus features here, a fine addition to the growing number of Doctor Who titles on Blu-ray. All site content © 2000-2019 Peter Canavese. Page generated at 04/25/2019 03:30:40PM.